As a digital marketing partner, we work together to build your digital marketing strategy, implement, measure and optimize. We listen and you talk in a discovery session. The topic is WHY . . . . we listen to your needs, objectives and learn about your brand, business and market. From there, we dive right into the data and analyze what are your strengths, weaknesses, opportunities and threats. Technical SEO audits, PPC campaign reviews, competitive research and market analysis are just a few ways we learn and build a data-driven foundation for a digital strategy. Learn more about our discovery tactics. We then plan who, what, when, how and measurements for success with a documented marketing plan and strategy. Audience segmentation and personas help put together a more targeted strategy to reach your customers as efficiently as possible. A user experience and content marketing strategy will layout how to have the right message in the right places. Next is a measurement plan including a strategy to properly set-up analytics, goal tracking and funnels with proper benchmarking. We will also include key performance indicators for success. Creative discipline starts with a plan and habit. Never skip this step. Each business has a niche expertise and valuable knowledge to share. Customers stay loyal when they’ve put their trust and money with people who know what they’re talking about. SpotOn can create the messaging needed for optimum conversion and retention. Whether it be an entire website, a landing page, email, digital ads, blog content or social posts, we align your brand messaging with keyword research with essential call to actions to create the best user experience. It’s still true, content is king. Learn more about our content services. Strategic communication can be based on interactions like registrations, purchases or outbound messaging like newsletters sharing resourceful content from your blog, updates and new promotions. 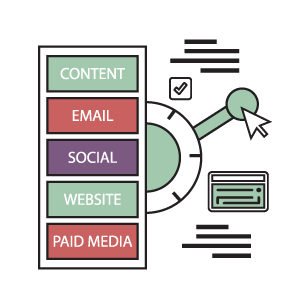 We can help streamline communication with marketing automation and we can manage your social voice across multiple channels with daily outreach optimized toward engagement and audience growth including listening and reputation management. Online listening outside of social media includes directory management, site listings, ratings and reviews. Listening is learning and learning is growing. Do you know what your customers and prospects are saying about you? Data driven results only happens with frequent monitoring and optimization of performance indicators. With every new tactic in place we determine the best measure for success and optimize daily toward that goal. We’ll talk quite often and in depth about engagement, retention, acquisition rates, open rates, bounce rates, referral traffic, page rank, keywords, click through rates, which headline and copy worked best, and many more. If you’re currently marketing and not talking this talk, stop. Message us. We are an extension of you and want to keep you involved and updated to the extent you are comfortable with. We use Basecamp to outline tasks, progress and communicate, so you can check-in when it's most convenient. We also schedule weekly calls so we are always on the same page and spend time with you on a monthly basis to provide an in-depth data review. We want to further efforts that connect people and communities in a meaningful way. Our customers seek a digital marketing strategy to launch a new initiative or grab hold of a market for established products or services.